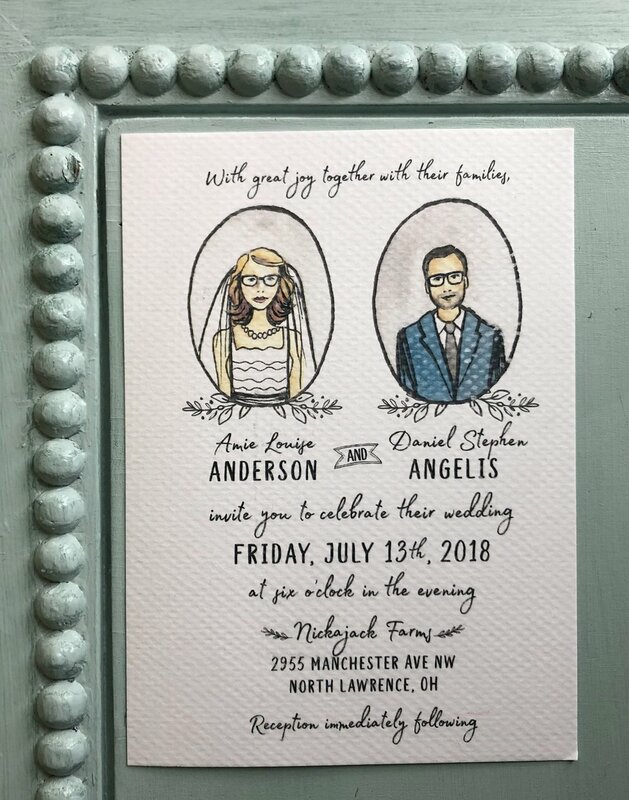 Recently these two love birds got married and I was able to make their wedding invitations a little more personalized that the typical invitation. 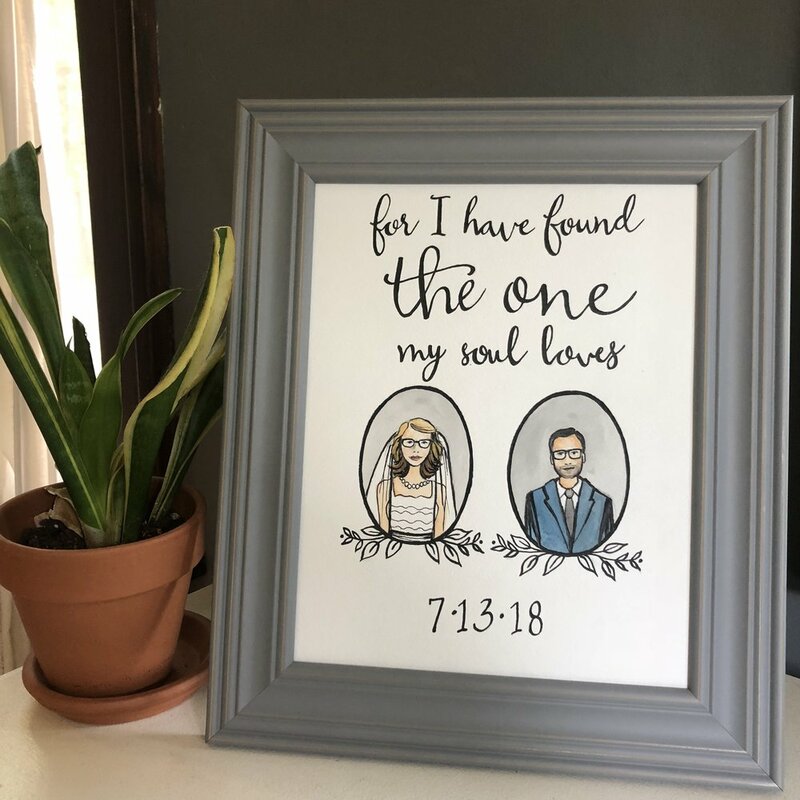 I used photographs of them to work from in their wedding attire and painted them separately in their oval frames. I love how they turned out on the wedding invitations! 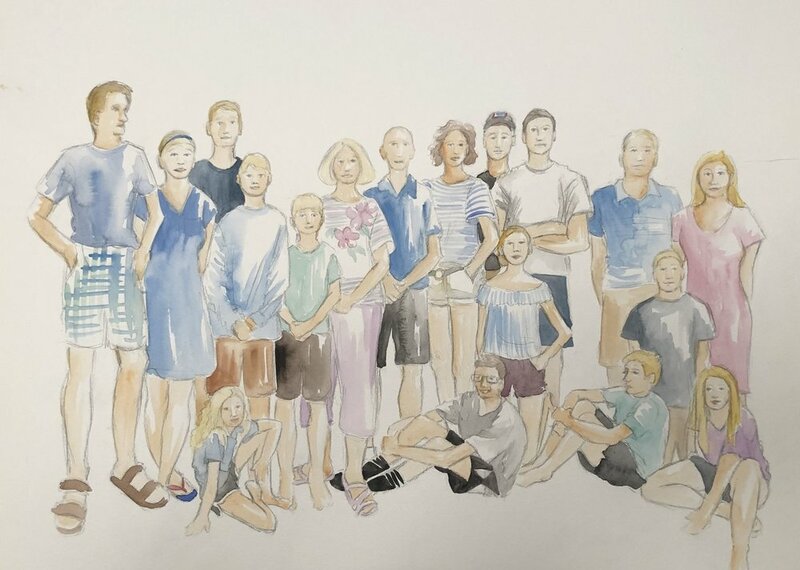 I just think it is such a unique idea and the watercolor sketches really make them lighthearted and fun! 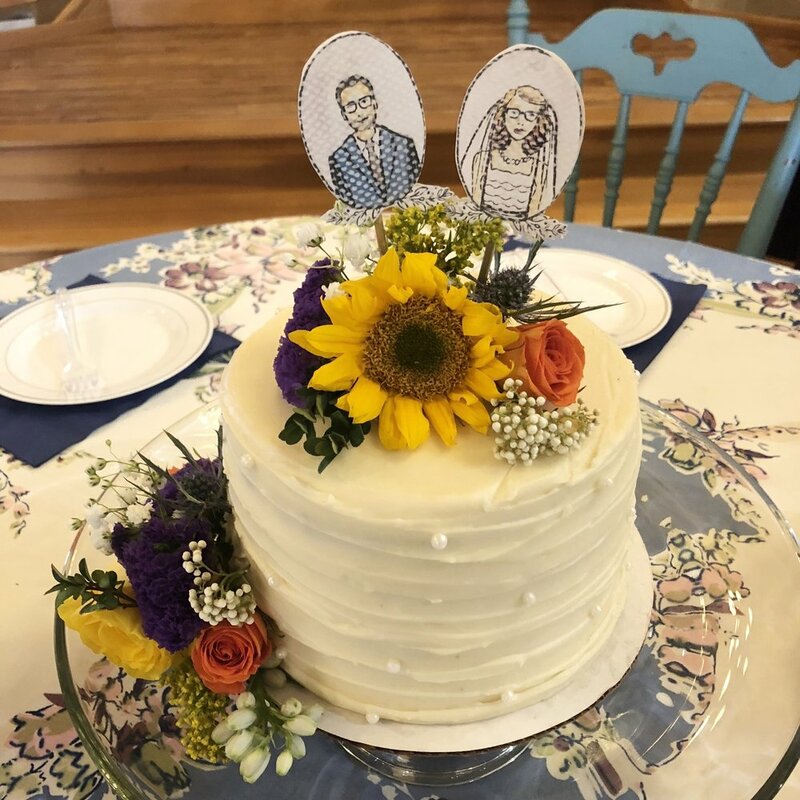 They even used them for the cake toppers! I love it when things are repurposed for different uses like this. I used the original painting that I did for the commission as a gift to the lovely couple. I also included the addition of a portion of a bible verse and their wedding date. It was such an honor to be part of their special day in this small way! I have always loved polar bears. I could watch them swim in the water all day! I decided that this would be the perfect animal to paint next! First, I sketched out my composition. I wanted the polar bear to be as close to life size as possible. During my research, I found that polar bears are about 4 feet standing on all four legs. I was able to make him close to life size being around 3 feet tall. He felt HUGE when I drew him up on the canvas and I loved the grand presence of him. For some reason, I always want everything I paint to be as life size as possible, whether it be people, etc. and, in this case, animals. It is so much easier to capture all of the detail in my subjects when they are larger, and then I almost feel like they are in the room with me and a part of my space. 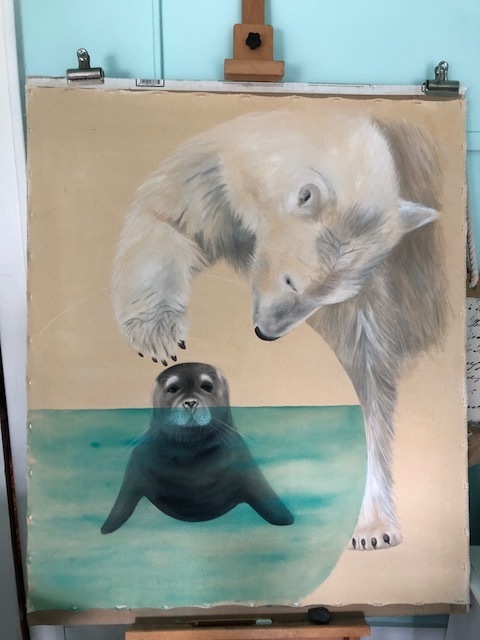 I began my mixed media painting with my first layer of colored pencils which is a great way to map out all the lights, darks, and variations of color before I lay down the paint. My mixed media technique is unique in that I layer pencils, then paint, then pencils, etc. onto my canvas. It really creates a beautiful depth and atmosphere to my paintings that I wouldn't be able to achieve in the same way with using paint or pencils alone. Drawing has always been my first love and years ago I found this mixed media technique that has suited me perfectly. It was magic the first time I ever tried it and I have been obsessed ever since! I was a little nervous about painting a white animal because sometimes it can be tricking creating the variations of tones in white, but it really helped starting off with a tan base so that it wasn't so intimidating and helped create immediate contrast between the white I was laying down on my canvas. One of my favorite things about doing art is studying a subject through painting it. I never would have realized that there were so many different colors in a polar bear's fur, or that lines form where clumps of hair separate (i.e. hand and head). 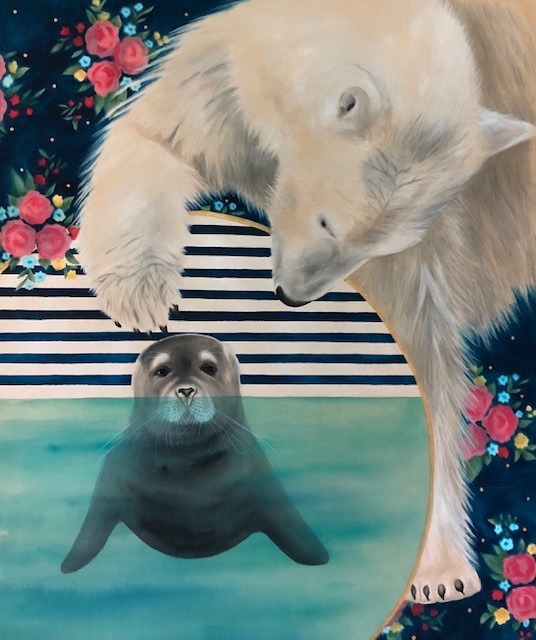 Florals and stripes are a classic pairing and the flowers were a great way to add some color into this painting since my animals were very neutral. I used the flowers as a repeating pattern in the background and used my paint without much water to create a soft texture to the flowers. This is a dry brush technique that I don't think I have used on my canvas paintings before and I really like the way it turned out. It gave the flowers a kind of velvety look. 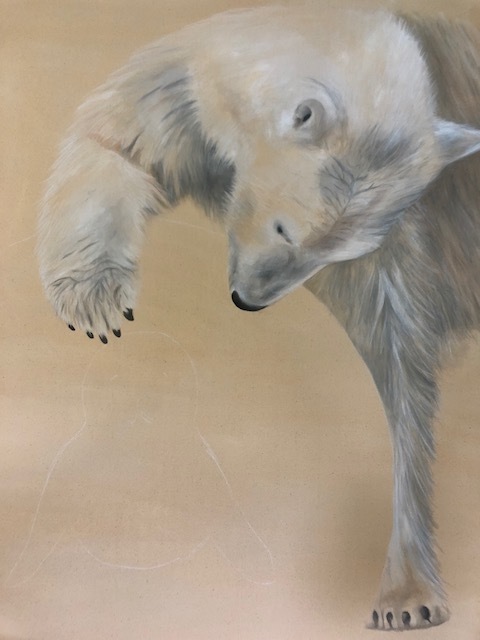 Painting the fur has been a wonderful way to show me that I can create a variety of textures with my medium and makes me want to explore other textures. 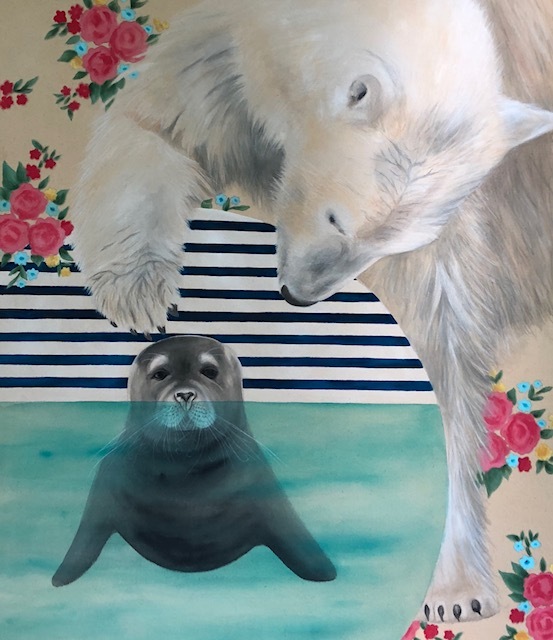 The final step was to paint a blue background around the flowers and really help make the bear pop. It sure did! 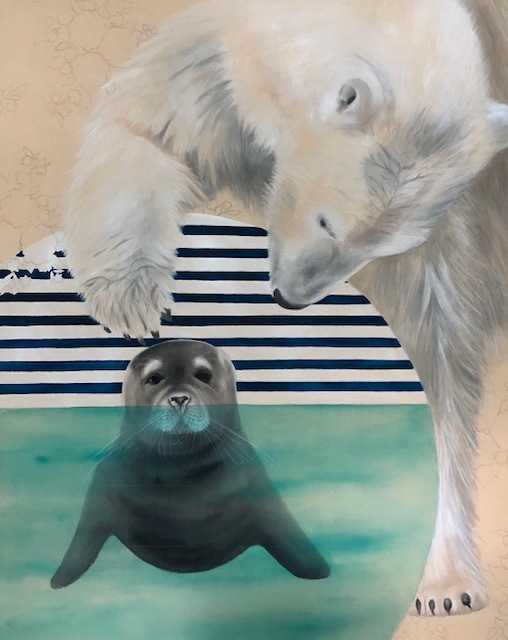 After I laid on the blue, the white of the polar bear was a striking contrast and I couldn't be happier with the result. I added a gold edging to the circle and gold dots for some embellishments in the background which is the cherry on the top for me! The finished painting is 30X36 inches and is available for purchase. Email me at taratories@gmail.com for any inquiries at all about this painting. It will be on display locally to the Akron area next month. More details to come on that so stay tuned! If you don't want to miss a beat, send me your email so that I can get you on my email list. I don't usually send more than one email a month but it is a great way to stay in the loop about local shows, art sales, etc. 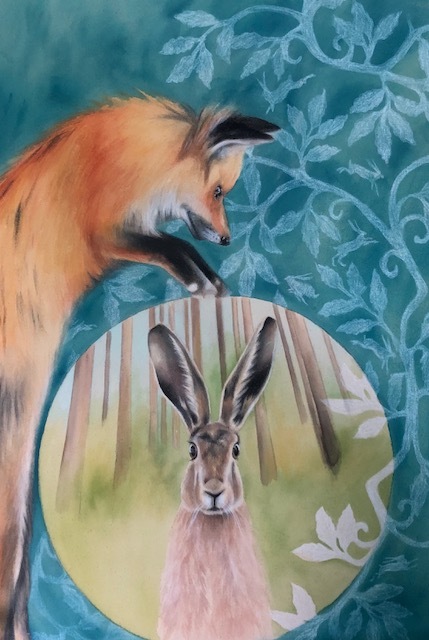 "The Fox and the Hare"
I began this painting with the idea of trying something new. 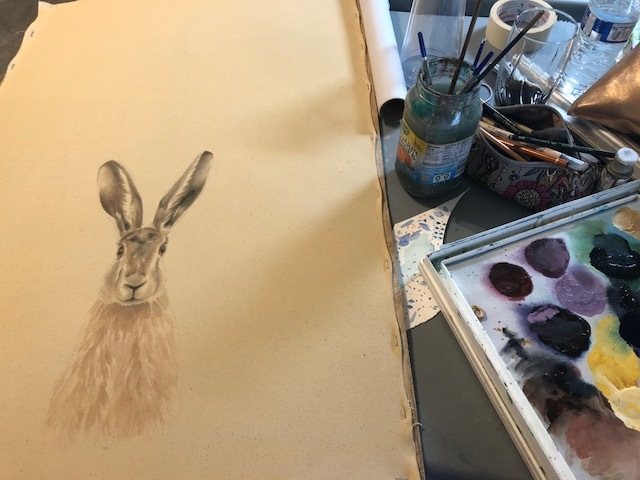 Animals are not something that I have not explored much before, but the thought of painting a sweet little hare was enticing. 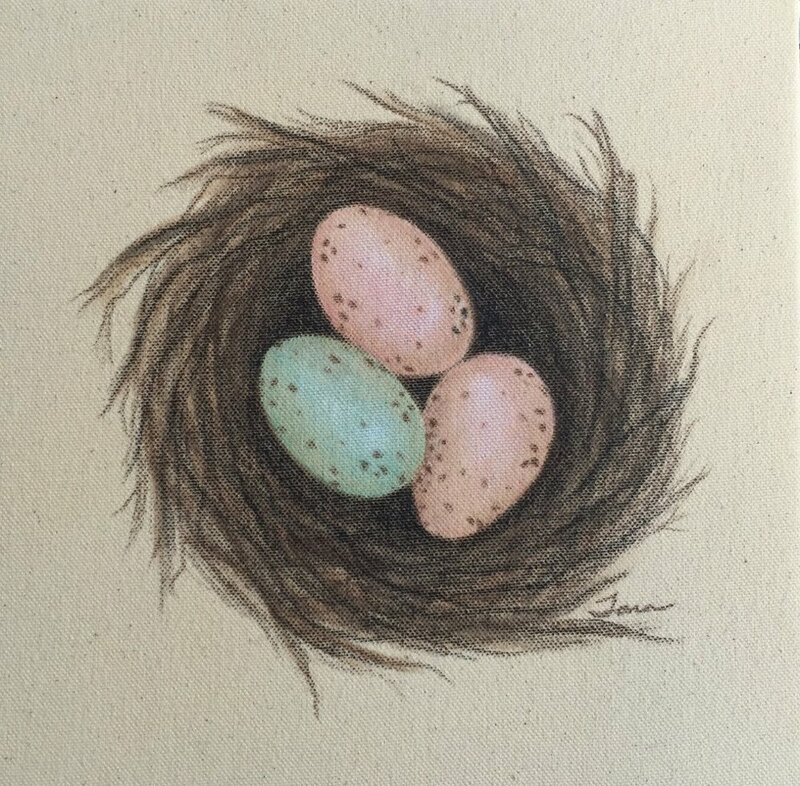 I use a mixture of acrylic paint and colored pencil in my paintings. I started by shading with my pencils on the canvas and then adding a layer of paint on top of the pencils. I continue the layering process with the pencils and paint until I get the results that I want. 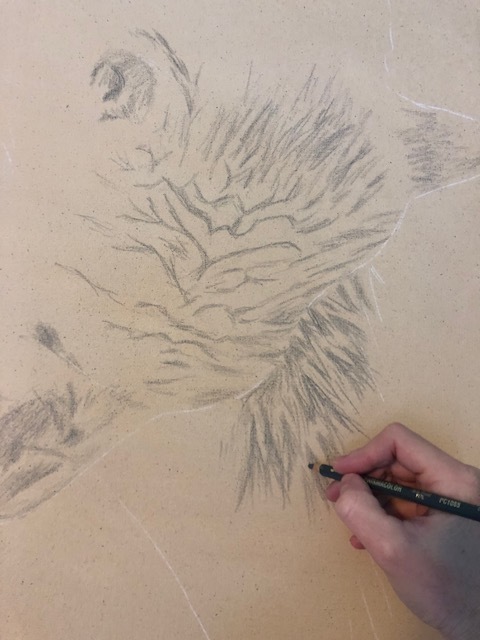 I discovered that the colored pencils are the perfect medium for capturing the texture of fur and whiskers, etc. which means my medium works perfectly with animals! I can also achieve the glassiness of an eye with my paints and pencils. The eyes seem to be the features that really brings the animals to life! 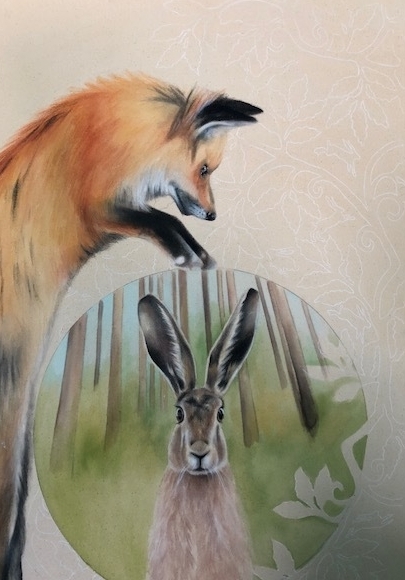 After I drew the hare, I naturally surrounded him or her in a circular frame which I usually incorporate into my work. I sensed a look of alarm on the hare's face which is why I added a predator... the fox. He is interacting with the hare, yet he is still separated from him. He is protected from his environment inside the circle. 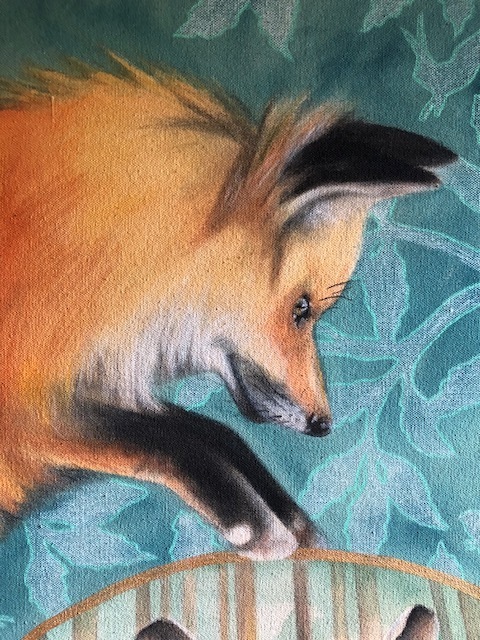 I just loved painting the orange tones in the fox and I just knew that a blue background would be the perfect compliment to his fur. Above is a picture of me with the painting right before I packaged it up and shipped it to its new owner. I literally sold it to someone as I was putting the finishing touches on it which was so exciting! 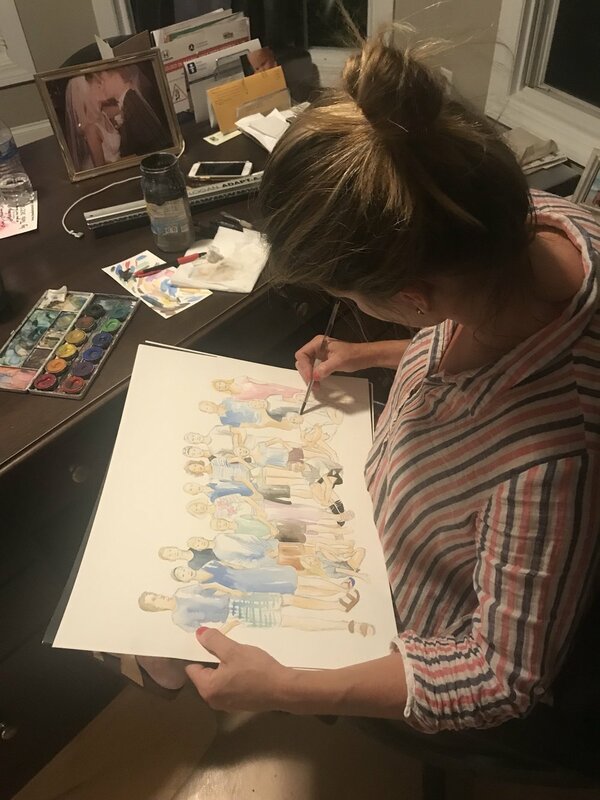 Someone reached out to me because she had seen my posts on social media of my progress shots and she was drawn to the painting for a couple of reasons. 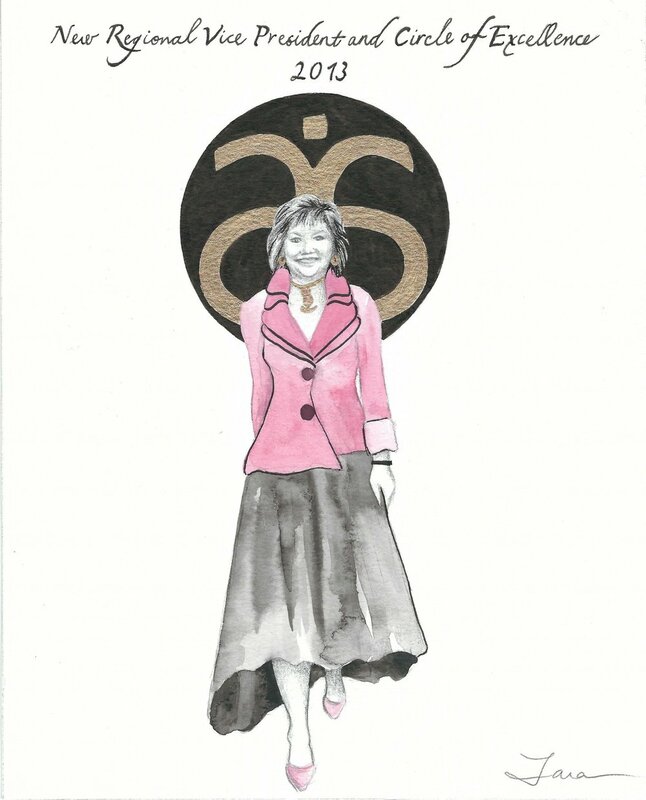 1. she collects rabbits, and 2. Her maiden name was "Fox"! How perfect is that!! I never know how people will connect with my art which really shows me that I need to keep being true to myself, because there will be someone out there that may connect for reasons I would never think of. Here is a photo of the painting in its new home and it looks like it was meant to live there! It brings me so much joy when I see my art in other people's homes and is truly the best part of my job!! 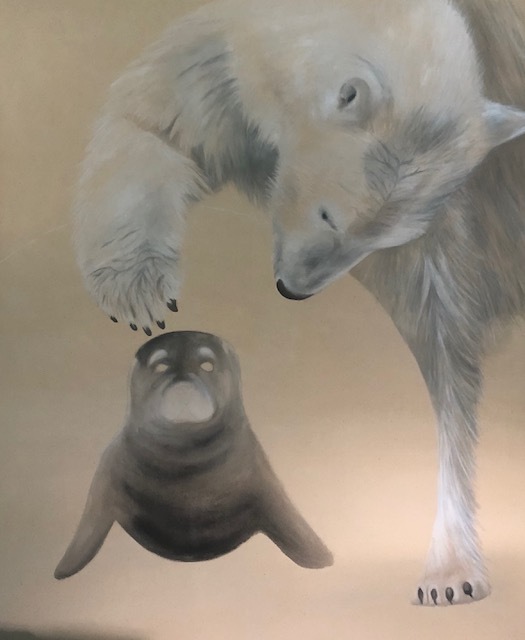 I am going to continue to try painting more animals and explore this idea of animals and their prey and hopefully build a collection. Stay tuned! For daily updates on my process, etc. make sure you follow me on Instagram and Facebook @taradeetscreek_artist so you won't miss a beat!